Q. What happened after the sixth game of the second set when you lost six games in a row? RAFAEL NADAL: Nothing. I think I was playing my best match here. The first set I think I played really good, having the control of most of the points, and I felt well. After that, at the end of the first set, I started to serve really bad; and second set still in the beginning, even if I won the games, because he had more mistakes than usual with the second serve return, I play less aggressive. That's true. But is because my serve didn't work that well, no? So I was thinking too much about the serve more than the game in that moment, so I stop a little bit the legs in that situation. The moment I had the 40-15 with 3-2, 3-All, after I had the break back, but I lost another time my serve. So the serve was the difference today in my opinion. It's true I play with less intense after the first set, but I think everything is because of the serve. So just congratulate him. I think he did better than possible to start one season. He's playing well. He's in the right place at the right moment. So all the best for him for the rest of the season. Q. You know what it's like when you get into a run of form and you feel so confident about everything in your game. Is that what you sense a little bit from Novak at the moment? Whatever the situation, he feels really good about it? RAFAEL NADAL: I can't have his feelings. Everybody has different feelings. Q. You know what it's like when you feel as though you're so strong. RAFAEL NADAL: Maybe, yeah. But seriously, for moments today -- I never like to say that, no, but for moments I felt I had the control of the match. So was one of these days then he start and he play winners from all the places, and I can't stop him. I think it wasn't one of his days. I think when I was playing really good, when I was playing well in the first set, he was defending more than me and I was more inside the court. I think I was playing better than him in the beginning. After that, it's true, he didn't have mistakes. He was more regular in his game without mistakes, even better than me. Always the better player win, and he was better player than me today in general. But the more positive thing is I played against a player who is playing better on the tour right now. When I played well, I didn't feel worse than him today. Q. Anything you can point a finger to? RAFAEL NADAL: If I had the solution, if I know the problem and the solution, I will change during the match. So I think I lost a little bit the coordination. I have to analyze a little bit more why that happened, no? So it's too early, and I have to watch the video about what was totally wrong in my serve today, and work to improve. So is no more secret than work and learn about mistakes. Always is better learn when you are winning than when you lose. That's much better. (Smiling.) But for me, at the same time, is a very positive tournament, very positive result, very important points for me. Q. As you said, when you've had a month out of the game and you're not quite sure how strong you're going to be. To get a full week of tennis, even though you've lost the final, has to be somewhat encouraging for you. RAFAEL NADAL: I said yesterday and before yesterday, be in semifinals was a positive result for me. Be in the finals I think is fantastic result. Right now I am not very happy, because, I say before, it wasn't one of these matches, and I -- well if we started the match and I see Nole playing much better from me at the beginning, so I accept, I go home. I played a good tournament in the time. My feeling is not one of these days, so I felt I really can win today. I am a little bit sad for that, but that's the game. Sometimes I won and I felt that I wasn't ready to win. That's the game. I said for me it was a really positive thing even if I - really positive week or two weeks - even if I lost today. I said it is important 600 points for the confidence, one final for the confidence, and the biggest and the most important thing is I finish the week much better than when I started, no? So that's always a very good feeling, and that's a lot of confidence for the next tournaments start right now. When I play this tournament, probably the four months more important of the season for me, and to start with a final after one month outside of competition - and even if I am in competition, play a final in tournament like this, is very positive - so I am very happy for that. I have to keep working about a few aspects of the game. I think I had a few ones very positive for; moments, and other ones, like my serve and I think the intensity of the match for a few moments, that's the worst thing. But I think the tactic of the match when I was playing well in the beginning was really good. The forehand was much better than the previous days. The backhand I think worked well during all the tournament. Slice, too. I went to the net. A lot of positive thing; a few negative thing. And with these few things, I was not able to win today. So I improve that. Q. In the second set, the long game that ended the set, you had a breakpoint. If you had gotten that, could that have turned it around? Q. During the trophy ceremony, Novak said that for him you were the best player ever. What were your feelings at the time? Is that something he said to you privately? Was that a surprise to you? How do you feel about that? RAFAEL NADAL: Well, we have a very good relationship. I happy about what he said, and thank you to Novak. But that's not true, so... (Laughter.) He still beat. Accept that when that's not the true. Q. Could you talk a little bit about Novak's play? He's had this great run, maybe since Davis Cup, Australia, here. What has he done to pick it up? What's the difference? RAFAEL NADAL: One player cannot change in two months, because I played against him in London, and right now, four months later, seems like totally different. No, that's not the true, no? I think he always was a fantastic player. Probably I think he didn't play his best, even being No. 3 of the world, that's very difficult. But I think he didn't play consistently for moments, because his serve last year and the year before I think wasn't that good than what it was three years ago. So he had a little bit problems with the serve, in my opinion, a few years ago. But right now he change it another time. He is serving well, and he started the season winning. So is because he was ready to win, for sure, and he was the player who was playing better. But, you know, after winning a Grand Slam, and if the player who wins a Grand Slam is very good, like him, is very easy to continuing playing well. I know how confident -- how my confidence is after winning important tournament, and is much easier win next one. But I think is everything about confidence and nothing -- is not big change, no. Q. What was going through your mind second set and third set? He won six straight games, and you said earlier you felt like you were playing well and wasn't a big difference. But when he wins six straight games, can you talk about how you're feeling and your frustration? No, seriously, I say before I think I was too worried about my serve to play my best level from the baseline for moments, and that's what happens. My serve didn't work. He had the chance all the time to attack me with the second serve. I think I served 25% of the serves. I can't play with this percentage. Nobody can play with this percentage. Well, maybe if somebody can do it, that's mine, because always in the statistics, I am the player who win more points with the second serve. But playing against Novak Djokovic, is impossible with match play and with the second serve all the time. So that's what happened, and that's why I lost six games in a row and what's going on in my mind. Please put one first serve inside, so that's what I was thinking. And after that I start to think about the 6-0 in the third, so I was focused on trying to win a game. Q. For the No. 1 spot, who is the bigger threat, Federer or Djokovic? RAFAEL NADAL: We will see. Well, Nole start with big advantage right now, 3,000, almost 4,000 points, so that's a lot. That's a lot for serious player like him. That's a lot for complete player like him, because he can play really good on all the surfaces. He has a big advantage. Now, when I am talking about the No. 1, I'm talking about finish day No. 1, not being No. 1 during the season. Because that's important, but at the same time -- well, for me it's not that, the most important thing. If you finish the No. 1 of the year, No. 1 of the world at the end of the season, that's the most important thing. Well, he's right now in the best position. We will see what's going on. You know, I started the tournament 17th of the race; I gonna finish this tournament No. 6 of the race. That's a big improve for me, very positive. I am closer to the top positions, and Federer played a good semifinals, a good result, too. He's there. He's like Nole. He can play really good on all the surfaces: Miami, Monte-Carlo, Barcelona, Rome, Madrid, Roland Garros. After Roland Garros, I will tell you who is the biggest favorite to be No. 1, because is after two months of competition. Only thing I can tell you is Djokovic is in the best position. We will see what's going on in the clay season. After this, first six months of the season, we start to see what are the chances of everybody. Q. Del Potro said the other day he thought Novak had the best return of serve at the moment. Del Potro the other day said he thought Novak has the best service return in the men's game at the moment. Would you agree with that? RAFAEL NADAL: He's a very good returner. Difficult to say who is the better one, because we have to talk in general. We have to put all the surfaces together, not only hard court. So for me, David Ferrer is fantastic returner. Federer for sure, too. Andy Murray, too. Nalbandian is unbelievable. Djokovic is there; he's in this group. But say who is better than other one, for me is impossible. Q. What happened at 4-1 in the first set did? You consciously make any adjustments, or it just kind of fell in? RAFAEL NADAL: Well, I think that the match started a little bit strange for me because I -- well, strange and not strange, no, because I had few mistakes with the forehand. I think the first game of the return I played well. But when I served for the first time in the match, I think I had two or three unforced errors with my forehand, so that's not usual. That's maybe because I didn't play very good matches this week before. I played a good match against Karlovic, I think, but it's different, no, because you don't have the rhythm of the game. You return and after you take care but don't have mistakes, is different kind of match, no? He started without mistakes, and he was 3-0 or 4-1 with not many problems, no? After that I think I started to put more balls inside, play higher to his backhand, and trying to get the right rhythm, no? I think I did well. I played a few good games. I think he had a few mistakes than usual. That's help me a little bit. Q. Did you have a few problems your serve? RAFAEL NADAL: With my serve? RAFAEL NADAL: No, I don't think so. No, I think that the serve didn't work bad. I know Juan Martin is a great returner, so, you know, for me it was difficult. You play under pressure all the time, no? Because if you have a mistake with the first serve, with the second serve he will have a good chance to play aggressive, to go inside the court. You start every point defending, no? So you don't have any chance later. Q. Before today, he had beaten the last three times you played. Can you talk about where his level of play is now compared to 2009 the last time you played him? RAFAEL NADAL: The players? Him? RAFAEL NADAL: 2009 he won the US Open, and probably he played the best level of his career by far. It's difficult to play at this level all the time. That's true, no? The normal thing is not when you played your best. For me, my normal level is not when I played the final of the US Open, or I don't know. That's my highest level. For Del Potro, the final of US Open and semifinals for me was his highest level. So that's not the normal thing. You can arrive to this level, but not every day, no? And the normal level of everybody is a little bit lower always, no? Is impossible play all the time full power shots, all the balls inside, having serve all the time, first and second serve very fast. So I think he's doing well. He won a tournament four weeks ago. Right now he arrive at the semifinals having very good victories. I am happy to see him back on the tour. He is one of the best players of the world, to be sure. I sure he's going to be at the top positions very soon. Q. How much do you think you've improved since the 2009 US Open, maybe the serve, the volley? 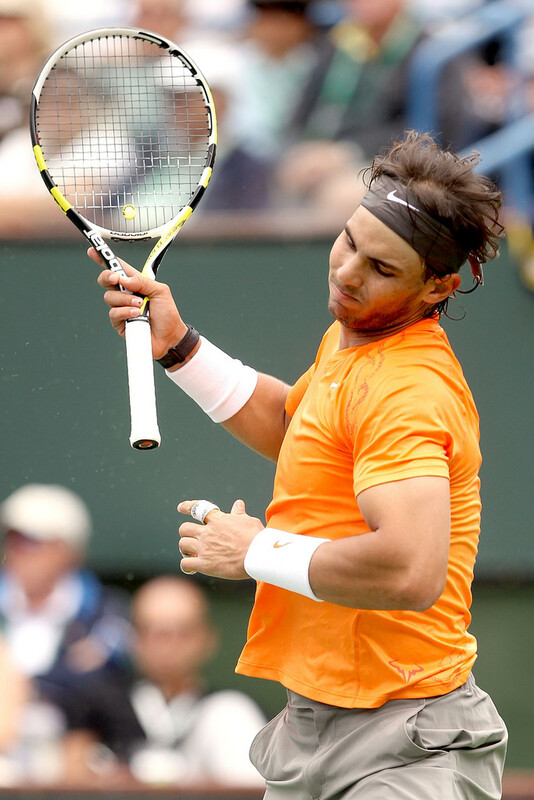 RAFAEL NADAL: Is not -- I had the three centimeters abdominal broke in that moment, no? I improved my game in general, but that year, the second half of the year, I had too many problems. I broke my abdominal in Montreal or Toronto, I remember, a little bit. After, seems I was a little bit better in Cincinnati, but after a few matches, another time I felt the abdominal. In US Open I was bad since the second round, but I keep playing, playing. Finally I had to stop one month without play. So we can't see -- we can't compare matches when you are not healthy. Q. How is your health right now? RAFAEL NADAL: You know, I am sure with my level of 2009 in that moment, without injury, I wasn't able to beat him, but not 6-2, 6-2 I gonna lose. That's my feeling, no? Q. But even outside of that match, your game overall from 2009 to now, you don't think there is any improvement? RAFAEL NADAL: Sure I serve much better than that moment. My backhand is better, and the forehand is similar, I think. But the better thing is I am playing closer to the baseline. I am able to play more inside the court, go more times to the net. So that's very important factor, no? Is much easier you play three meters behind the baseline than if you play one meter behind the baseline. That's 100%. The biggest improve I think in my game is the position on court. Q. As far as your health level in this tournament, how do you feel coming off the Australian Open where you had some problems? RAFAEL NADAL: I think I not playing like before the season. I was playing fantastic before the season, and when I started in Abu Dhabi. I had a few problems there in the leg, in Australia, and have a virus in Doha. Coming back after one month and a few more days outside of competition, to come back and play a final another time is fantastic news for me. It's a lot of points, and, you know, for me is really, really important this coming back. Winning matches like today is how you can come back to your highest level. Q. You said earlier about normal being when you don't play your best. Is that the mark of the truly great player, that you can adjust, sort of adjust on the fly to what your game is that particular day or what the opponent is throwing at you? Your physical position? RAFAEL NADAL: Biggest difference between, I think -- the best players of the world or a little bit lower on the ranking is when you play well, you can beat and you can win everybody, and you win because you are playing really good. But when you are not playing that well, the important thing is keep winning. That's the highest difference, no? Because that's give you a lot of confidence, and that's give you a line of regular results. When you are playing bad, if you lose in first round or second round, is a really bad tournament. But when you are playing bad you are in quarterfinals, semifinals, it works. So because that's a lot of points, that's confidence, because even you play bad, you win. Next week gonna be better. If next week you play better, you gonna have better chance to win the tournament. The important thing is arrive at your limit every week. If your limit that week is quarterfinals, arrive to quarterfinals. Don't lose in second round. That's what I think. Q. When your level drops, when you're feeling your level drop, what do you do? Do you try to focus on a particular shot? RAFAEL NADAL: No, you never know what is my level, because I know what is my level when I am winning Monte-Carlo, Barcelona, Rome. I know my level is high in that moment. Or when I won in hard, I don't know, in 2009 in the beginning of the season in Australia, and then I came here and I know my level was very high. Right now, you know, last year I had a fantastic season. I know if I am playing well, I have good chances to have good results. I don't know if tomorrow I gonna play my best level or not. I'm sure I'm gonna have better chances to play much better than yesterday and much better than today, because the match of today give me confidence. I felt the ball much better in the end of the match than in the beginning. So all these things are important, not only for my final tomorrow, because next week is Miami and in two weeks start the clay season, and that's very important for me, and the confidence to start probably the four more important ones of the season for me. Start of the final is fantastic news. Q. I mean, we know you played Roger and Novak a hundred times. But when you go out to play them, either one of them, what sort of a sense do you have? And also, how will the conditions over here affect if you're playing Roger or playing Novak? RAFAEL NADAL: We know each other 100%, no? These kind of matches always is the same. These kind of matches gonna win the player who's playing better in that moment. Because the level is very, very difficult to say, You play better than the other one, because it depends on the week. That's my feeling, no? And the player who have better inspiration that day is the player who gonna have better chances to win. Q. Before Roger walked on the court today, he said he felt motivated watching you win for an opportunity to play you. Do you have that same kind of feeling? If Roger wins, that kind of excitement? RAFAEL NADAL: For me, my feeling is be in the final. Be in the final, that's personal satisfaction very big, and that's give me a lot of motivation. And play final of Indian Wells, for me the motivation is not the opponent; for me the motivation is the tournament, you know. Is too important final of Indian Wells to think about which opponent you gonna play against, because more important thing is the victory of the tournament.